Skeletal muscle wasting, a process commonly associated with aging but also seen with various chronic diseases (obesity, cancer, kidney failure), situations of immobilization (accidents, post-operative periods) or prolonged weightlessness (astronauts), strongly impacts quality of life. Researchers from the Cardiovascular, Metabolism, Diabetology and Nutrition (CarMeN) laboratory (Inserm/Inra/Université Claude Bernard Lyon 1/Insa Lyon) in Lyon (France), led by Hubert Vidal, Inserm Research Director, in collaboration with the team of Dr. Jérome Ruzzin from the Department of Biology of the University of Bergen (Norway), have discovered that a hormone produced by the intestine called fibroblast growth factor 19 (FGF19), is able to increase skeletal muscle mass in mice and increase the size of human muscle cells in culture. The researchers have also shown that FGF19 protects from muscle wasting in various experimental mouse models, highlighting its potential therapeutic value. These results were published in Nature Medicine on June 26, 2017. 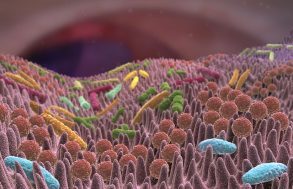 Fibroblast growth factor 19 (FGF19), an enterokine (hormone secreted by the intestine) well known for its effects on biliary acid metabolism in the liver, is also able to target other tissues and play a glucose-regulation and lipid-homeostasis role. When investigating the therapeutic potential of FGF19 in metabolic diseases such as type 2 diabetes and obesity, the researchers showed that mice treated with FGF19 for 7 days gained less weight and adipose tissue despite eating more than the untreated mice. Under these conditions, the researchers have shown that skeletal muscle mass and muscle strength increases in the treated animals, thereby identifying for the first time a new role of FGF19. 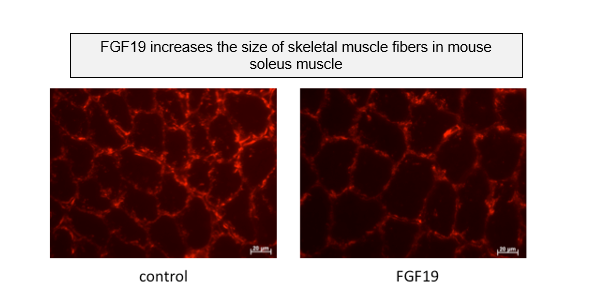 At the molecular level, the researchers have identified a signaling pathway that mediates the hypertrophic effects of FGF19 in muscle and show that this effect is the consequence of enlarged muscle fiber size, irrespective of the type of fiber. 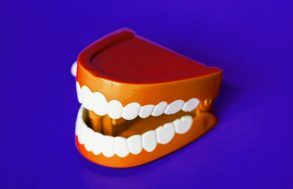 The researchers then demonstrated the therapeutic potential of FGF19 using various mouse models of muscle wasting, including glucocorticoid-treated mice, genetically-obese mice and aged mice. In each model, they demonstrated the capacity for treatment with FGF19 to maintain or increase muscle mass and strength. “For the first time, this demonstrates a potential use of FGF19 to fight skeletal muscle wasting and possibly also in agronomics to increase livestock muscle mass,” concludes Hubert Vidal and his collaborators. They envisage setting up clinical trials to validate these observations in humans.